A back injury caused by an accident can leave you unable to work, care for your family or even handle day-to-day tasks. When you or someone you love suffers a back injury, it is important to consult with an experienced attorney who can investigate your case, determine the cause and identify all responsible parties. 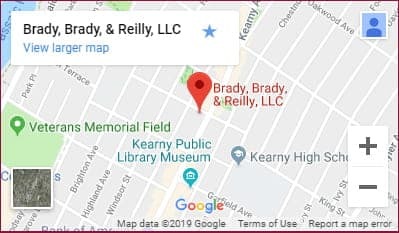 At Brady, Brady & Reilly, LLC, in Kearny, New Jersey, we have extensive experience handling complex legal claims involving serious back injury caused by motor vehicle accidents, construction accidents, workplace accidents and general negligence. After an injury, you may be entitled to compensation for medical expenses, pain and suffering, rehabilitation, long-term needs and other personal losses you have endured. As your attorneys, we will take every necessary step to ensure that you recover the full compensation you deserve. We will review medical documentation, determine the value of your losses and aggressively pursue your claim through settlement and negotiation, or trial when necessary. In addition to immediate medical expenses and wage loss, many victims of serious back injury require rehabilitation and other support to help them on the road to recovery. Our firm will take the time to understand the unique challenges you face and develop an approach to protect your rights and financial security and help you face the future. Lawyers from our firm will seek out appropriate medical and financial resources to support you and your family. Free consultations · Evening, hospital and in-house visits · Spanish and Portuguese language services available · Se habla español · Call (201) 997-0030 or contact us by e-mail to arrange a case evaluation directly with a North Arlington rear-end collision attorney.